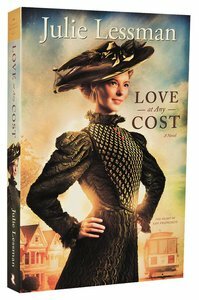 About "Love At Any Cost (#01 in The Heart Of San Francisco Series)"
Customer Reviews For "Love At Any Cost (#01 in The Heart Of San Francisco Series)"
A tangled story of family secrets in a historical setting that is engaging, funny and entertaining; with detailed and interesting characters. The story evolved beautifully and I was not expecting the twist near the end of the story. This is a novel that captures the heart, it truly reflects the scripture verse in Proverbs 3:5-6 through this moving story of love, trust, forgiveness, redemption and hope. A delight to read. I look forward to reading the next book in this series. I really enjoyed this story, especially the struggle between passion and waiting on God's best. 'Love At Any Cost' tells the story of Cassidy McClare. Cassie is a Texan ranch girl with a heart for helping young girls be the best they can be. To flee from the heartbreak of her fianc leaving her,Cassie travels from the comforts of her home to San Francisco where she is welcomed with open arms by her cousins and Aunt. Jamie McKenna, a good friend of the San Francisco McClare's catches Cassie off guard with his good looks and easy humour.Cassie's time in San Francisco however may end up resulting in the very thing she was fleeing from. At first I was worried about whether I would enjoy this series as much as Lessman's others. I had nothing to worry about however as once again Lessman creates a believable world where her characters come to life. Lessman uses her gift of writing to teach the reader valuable truths about God and His ultimate love for us. I would definitely recommend this book. This book was so good that if I could I would give it 6 stars. What a story. Every character in this book was endearing and lovable in their own way. A great tale of learning to trust God and not your own insight. A great lesson about what has true value. A feisty heroin, a determined hero and lots of sparks. The perfect combination for a perfect book! I was ending a reading fast (with the only book I was allowed to pick up under the conditions of the fast was the Bible) when I went to my local bookstore and spied Julie's book. What a book it was! It's been ages since I read any of Julie's books. The last one being A Heart Revealed (which I enjoyed) and I'd kind of forgotten how emotional and drama filled her books are! Having also read A Hope Undaunted, where I struggled with Luke (sorry Julie, but I just don't like the guy), then moving to Sean in A Heart Revealed (I liked him a lot) to Jamie now in Love at Any Cost, I have to say this first book in the series has won my heart - mainly through Jamie. Oh, he's smooth alright, but there's something about him that just captures my heart. For me, one of the main differences is he's not as bull-headed and dare I say it, brutish (winces and hides face) as the men in the O'Connor girls lives. In fact, I found all the men in this book, strong, opinionated, determined but not overbearing and this was sweet relief to me. So back to the book now that comparisons are over! Cassidy is a tough, no nonsense girl who has a broken heart when she comes to San Francisco to visit her cousins. The last thing on her mind is falling for a guy, especially a smooth talking, pretty boy like Jamie McKenna - which she does thanks to Jamie's aforementioned smooth talking ways. She tries hard to set up boundaries with Jamie and he kind of follows them, but he likes to push boundaries. Jamie is stubborn, a man of pride having pulled his family out from the slums of San Francisco's Barbary Coast and refuses to believe that he God might have anything to do with his life. I liked Jamie more than Cassidy. I felt him to be the more well-rounded character, maybe because his road to faith wasn't paved yet and that is what we get to see. Some people might not like Jamie, branding him a fortune hunter, womanizer, smooth-talker but he's not a Christian for the majority of the book. He doesn't know God and his saving grace and his pride in firmly in the way. I love his friendship with Bram (I can't wait to read his story), it's honest and Jamie understands that Bram values honesty above anything, so it's a real friendship. Cassidy, at times has a little too much spit-fire and she aims it rightfully most of the time at Jamie. She's hurt and hurt women tend to paint all men with the same brush. I felt though that Cassidy didn't lean on God like she professed until the end and it felt like it was wrapped up very quickly. However, I loved her relationship with Aunt Cait - what a true, deep, abiding love these two women have for each other. It was really lovely to see what wise counsel can achieve when listened to. I'm very excited to also see how Aunt Cait's relationship with Logan McClare continues to unfold! I'm looking forward to reading more from the McClare clan, Julie and the passionate romances that will rock their lives along the way!